Strategy games eh? For so long the preserve of PC gamers (in fact my first experience with this game type was many many moons ago, as a university student playing Dune 2 on a housemate’s PC), there have been few successful entries on the Xbox. The most notable of these has been the Halo Wars series, which entertain by being a multi coloured laser-fest, using vehicles to do the fighting, in addition to the foot soldiers. Numantia is a beast of a different stripe, swapping the future for the past, science fiction for reality and laser rifles for swords. Can it still entertain? The first thing that this game makes clear is that it is based on a real place and real events from the time of the Roman Empire. Numantia is an ancient Celtiberian settlement in Spain, and I can’t be the only person never to have heard of the Celtiberians? Anyway, way back in the year 153 BC, the people of the town of Numantia had their first argument with the Romans, when they took in the refugees from a town called Segeda, whose leader had defeated a Roman Army that had attacked. The Romans, not being ones to let it lie, then went on the rampage to get revenge, and thus the fate of Numantia was sealed. This history is played out in the tutorial level of the game, which sees the Segedans trying to escape from the encircling Roman army. As the tutorial helpfully explains, you are meant to lose this battle to allow the rest of the “story arc” to be set up, so I wasn’t feeling super motivated to try, if I’m honest. 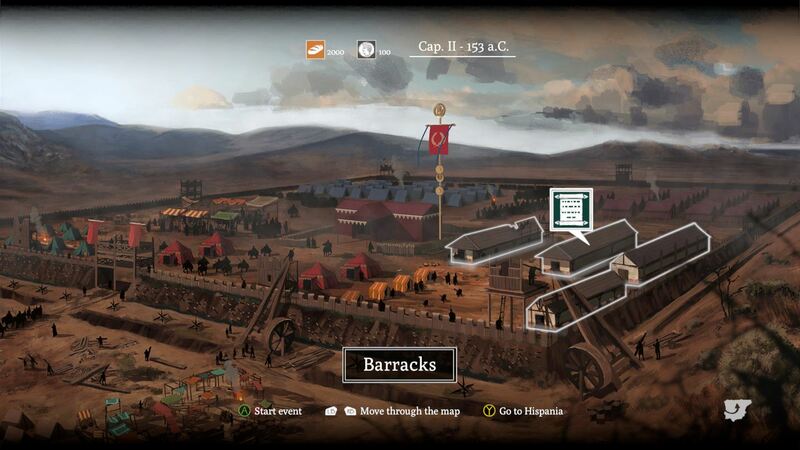 Having either won or lost (depending on which side you choose to take, the Romans or the Numantians/Numantenes/whatever they may be), the game opens out into the campaign proper, which centres around either the Roman camp or the town of Numantia. The game is split into “Capitulum” or chapters, and each one can be made up of a number of events, not all of which involve combat. In an interesting move, there are missions to undertake which involve diplomacy, and your answers or choices in these missions can lead to either combat or to a more helpful outcome, such as more supplies being available. Supplies are required to hire soldiers and keep them fed, and also money can be earned which can be used to buy more goods from the market. I found this reliance on the open market economy a bit strange for the Romans, as they are an army and should therefore just be given the weapons and man power that they need to get the job done. Still, it adds another layer to the game, as fielding a depleted army is a one way ticket to Defeatsville! Another little feature of these missions is not really explained in the game, which is always super helpful. If the diplomacy fails and you end up in a scrap before the decisive fight at the end of the chapter, any troops that are injured stay injured. So if your heroes (more on those later) get hurt, they will start the final mission of the chapter at less than optimal health, and as such the battle becomes even more of a task than it would be otherwise. This, you’d think, would be critical information that you need to know, but it was a shock when I got my posterior handed to me after fielding an army at a little over half health, which were rolled up by the Numantians without them even breaking a sweat. In addition, playing as the Romans seems to be particularly unrewarding, as the Numantians move and attack first, and also seem to be a lot stronger. 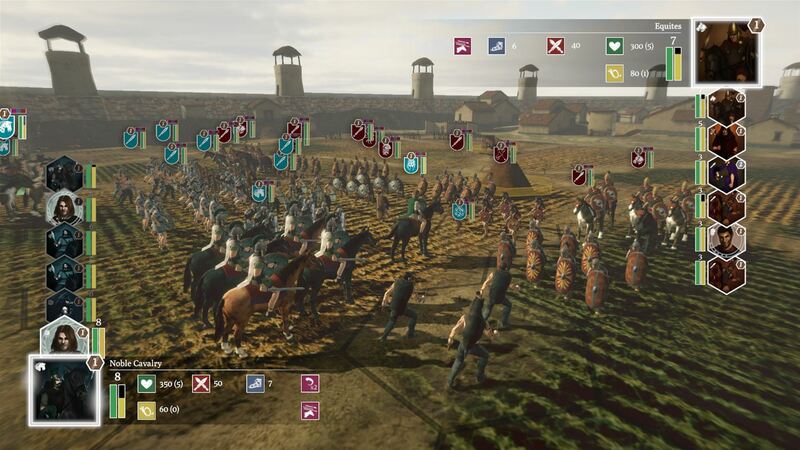 Seeing my Roman elephants being taken out by a unit of swordsmen was very upsetting, especially as I find it hard to believe that would happen in real life, which this game is based on. How can it be right that six men with swords can do more damage to two elephants than the elephants can do to them? Still, a little willing suspension of disbelief is a requirement for all games, so I’ll let it slide. For now. So, after all the faffing about talking to people, buying things and making sure your army have the correct gear for the fight, it’s time to head into battle. As this is the meat and drink of a strategy game, you’d be expecting this to be the pinnacle of Numantia, and you would be right. 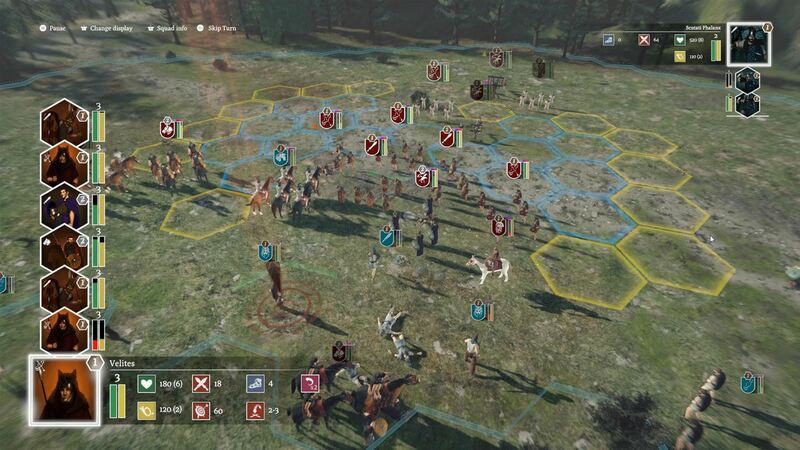 The battlefield is divided up into hexagons, and before the fight begins you can place your troops as you see fit. It goes without saying, but troops left on their own and isolated will be quickly overwhelmed, so moving them into places where they can support each other is a good opening strategy. 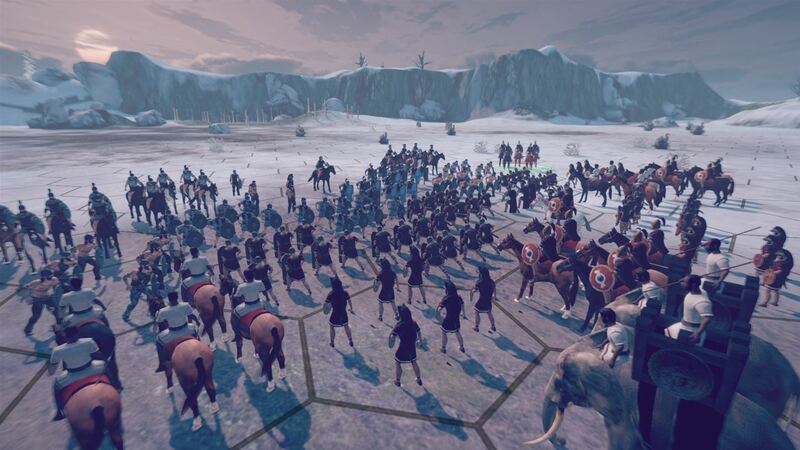 There are a number of different classes of troops to contend with as well: Ranged troops come with either slings or javelins, first and second rank close-combat troops that bring different armour and loadouts, cavalry troops on horses, special troops – such as the Roman elephants or Scorpio giant crossbows that aren’t as effective in game as you’d hope – and finally the heroes themselves. Each unit has a range that they can move, which is signified as a blue area, and they also have a yellow area that they can move to at the cost of some morale. After the movement phase is done, each unit can attack if they are within range. Here another important part of the strategy comes in: if you can attack an enemy unit from the flanks, or better yet the rear, then you will gain an advantage. It’s always worth manoeuvring to get the best position, particularly if you are attacking a stronger unit with a weaker one. As you might expect, cavalry can move further than foot units, and can often be in the vanguard of any attack. It’s vital, however, to make sure that the enemy ranged units can’t use their range advantage to pound your units from afar; closing them down and attacking close up is an effective tactic to reduce their damage output. The Numantian sling troops are very effective at an extended range. Each fight is a fight to the death, with only complete annihilation of the enemy being considered a victory, so ganging up on enemy units is a completely valid tactic, and quite often the only way to win as the Romans, as any straight up fight usually ends with the Numantians being victorious. Who knew the Iberians were such a powerful fighting force! Moving on to the controls, and here the wheels of Numantia start to look a bit wobbly – if not fall off. Telling your units where to move with the left stick is hit and miss at best, making it hard to move them to where you want them in the most efficient way. Once they are placed, you have to press A to confirm it, then press A again to say “I really mean it”, then choose which direction the unit has to face by pressing A again. Why so many presses? Even moving the camera around isn’t as intuitive as you might hope, with it being mapped to the d-pad and the right stick; the stick moves the camera around, while the d-pad is responsible for rotating the camera around the point it is focused on. This never failed to irritate me, with having to use the right stick to look at the patch of ground I wanted to examine, then having to use the d-pad to rotate around and look at surrounding troops. The left and right triggers zoom in and out, respectively, but I found the game the easiest when it was zoomed all the way out, giving a good overview of the action. As I touched on above, A is used to confirm actions, but X lets you use defensive skills and Y to use a unit’s special power – neither of which were not touched on in the tutorial again, and came as a pleasant surprise when I noticed I could press other buttons. Given that there are achievements tied to using the heroes special powers, I feel, a bit of warning would have been nice. Graphically, and it seems like historic Iberia was very brown, or at least its battlefields were. Each fight seems to take place on the same backdrop – a dreary hexagonal landscape. The units are nicely drawn and animated when fighting or moving, but sound effects are limited to tinny sword clashes and the occasional elephant trumpet. So not wildly inspiring. I think the term “functional” was created just to describe this game. The parts that are not spent in battle are played out over a static backdrop and even the choices you have to make are demonstrated using a still image of the person you are talking to. Again, functional is about the best I can say for the graphics on display here. All in all then and Numantia is a bit of a disappointment. 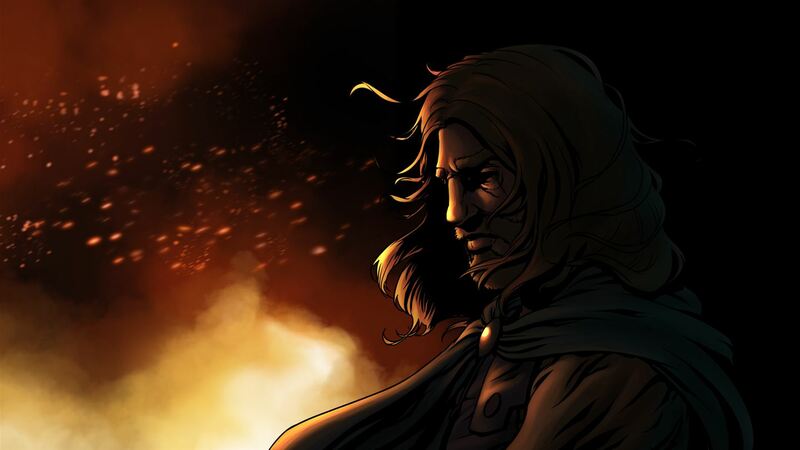 In a not exactly over saturated strategy game market, it is worth a look, but it is so po-faced and serious about the subject matter – for want of a better phrase – the developers have forgotten to insert any fun into Numantia. If you are gagging for a new strategy game, this may well scratch the itch, but it never managed to light my fire. Life in the old days was not much fun. Finally a game that represents that aspect of day to day life.